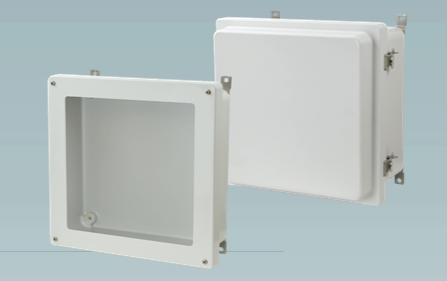 New 12 x 12 Enclosure Size from Allied! Expanding our series of fiberglass reinforced polyester enclosures are the new 12″x12″x4″ and 12″x12″x6″ size options. The new sizes allow for increased space for electrical components while boasting a variety of features and benefits. They feature both flat and raised matching covers with a variety of latching options that allow you to provide the level of security and ease of access needed for your application.